Making eggs like this will be well worth the extra minutes of investment. 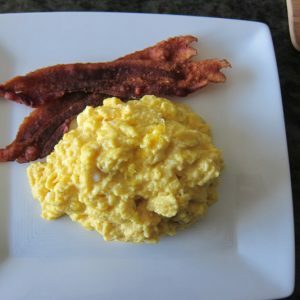 The result is perfect scrambled eggs, you'd swear there's cheese in them. Combine the eggs, heavy whipping cream and salt & pepper. Whisk well until everything is combined. In a small skillet over LOW heat (use the smallest burner on your stove), melt the ghee. Dump in the egg mixture. Now…here’s where you have to be patient. Continuously stir the eggs around the pan using a spatula. It will take several minutes for the eggs to cook. You may have the urge to up the heat and get the process over with. Resist. The. Urge. After several minutes (mine took ~8 minutes), the eggs will be cooked through and very creamy instead of rubbery little lumps like normal scrambled eggs. Serve with a side of bacon for pure bliss. *It’s hard to find heavy whipping cream without the additive carageenan. Even the organic brands tend to add it. Carageenan is used as a thickener derived from seaweed which sounds cool until you consider that it’s known to promote intestinal inflammation. Not cool. For those of us living near a Trader Joe’s, their organic heavy whipping cream is carageenan-free. Read your labels, folks ? Substitute coconut milk if you don’t do heavy cream.